Today let’s discuss a simple approach to parenting that can have hundreds of applications. As the summer approaches, many of us begin to worry about the possibility for endless screen time, countless arguments over chores, children that will morph into couch potatoes with deep roots, bored children whining all summer long, and the list goes on and on. Furthermore, everyday parents try to come up with ways to get their kids to help around the house, to play outside, to practice instruments, and to completed various tasks. Lastly, some parents just want a simple tool that serves as positive reinforcement for a child whose behavior needs to change. Figure out what is your children’s most favorite thing to do if they could choose anything. Most children covet screen time – iPad, TV, Phone, iTouch, video games, Snapchat, Facebook, etc. Money is irrelevant to non-teens and it generally is not a good idea to set up an expectation that they get paid for every little thing. That is not how the real world works, so let’s not enforce that and create unreasonable expectations for teens. Some kids covet time with family, with mom, or with dad specifically. Each marble or small non-chocking hazard object equals 5 minutes of screen time or parent time. This time frame can be changed to any number of minutes you wish. The number of marbles per chore depends on how much they loathe that specific job. The more disliked the job, the less likely they are to do it, therefore increase the marble count. For instance, in my house, making beds and taking showers used to be huge burden, so the number of earned marbles was on the higher side. This captured my kids attention, so the jobs were done first because more marbles were earned faster. Family time earned needs to be a special choice the child makes – red box movie with mom, bike riding with dad, going to the park with both parents, etc. DO NOT take marbles away for bad behavior. Create other consequences. This is a positive reinforcement plan only. If a child is likely to loose marbles for bad behavior after wroking on chores, they will not continue to help out with chores. For those who cannot read: Pinterest has tons of downloadable pictures you can cut out for free. 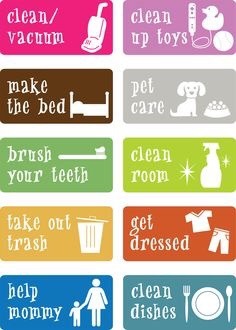 Etsy has tons of chore chart stickers. Kids can draw their own versions. 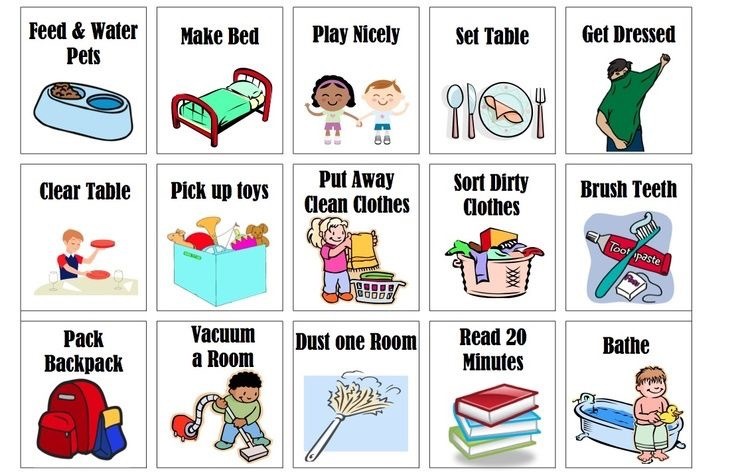 For those who need positive reinforcement for Everything because they are defiant, hyperactive, inattentive, oppositional, or simply don’t care, break down the chore chart to the most basic things. For example, for some kids “getting dressed” may seem like a insurmountable task and one at which they will fail most of the time. So break that down to Underwear, Pants, Shirt, Shoes, etc. For some children, it is best to focus on one part of the day, only, until they establish a habit of doing those things over and over again. Once fighting and whining subside and things are getting done, tackle another section. As an example, Morning Routines are usually a Horror Freak Show for most families. Spotlight the details kids have most trouble with and make a chore chart for those specifics that need to improve during that part of the day. As always, feedback is appreciated it, whether this a good or bad solution for your family. Brilliant idea! I love this. Thanks. It works in my house like a charm. I’m going to give this a try. Mornings can be so “enchanting” in my home. My son will forget the most simple things such as his pencil box…he will get detention for not having his supplies which leads to a meltdown possibly a call that he is sick..so I have to turn around go home and fetch his supplies. I might be doing this all wrong but I swear no one gave me a manual on how to raise a child. Just doing my best here. His sister is the complete opposite, often saves the day by sharing her things with him. Your post is fantastic, I will give this all a try.